Wheat flour is roasted in little bit of ghee till golden brown in color. The mixture is then mixed with jaggery and sesame seeds and made into small balls with few tablespoons of milk and ghee. Store the wheat flour laddu in a dry jar and these stay fresh for up to a week. 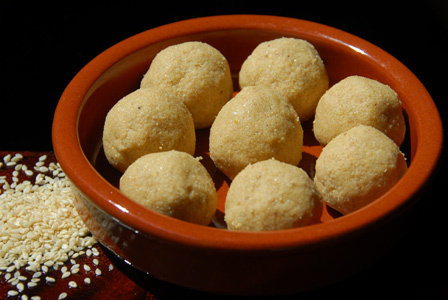 Makes: around 12 Wheat flour Laddu. Heat a pan on low heat, add a tsp of ghee, add wheat flour. Roast the wheat flour until its aromatic and golden brown in color. Add jaggery, white sesame seeds to the pan immediately and stir. Cool the roasted wheat flour mixture to room temperature. Remove the wheat flour powder onto a mixing bowl, add melted ghee and milk. Mix well and form lime sized balls out of the wheat flour mixture. Store the wheat flour laddu in a dry jar and these stay fresh for up to a week. Notes: Make sure to roast the wheat flour right. Suggestions: Adjust the milk accordingly to make the wheat flour mixture into laddu. Variations: You can add sugar in place of jaggery if desired. Other Names: Wheat flour Laddu, Godhuma Pindi Laddulu. White sesame seeds are lightly toasted and ground into fine powder along with cashew nuts and jaggery. The mixture is then formed into small laddoo. 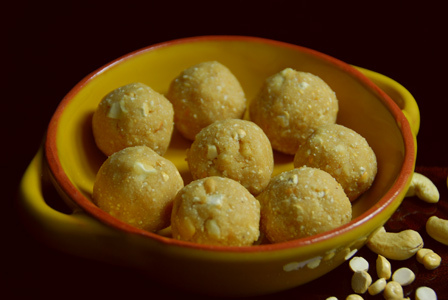 Serve sesame cashew laddu as necessary. 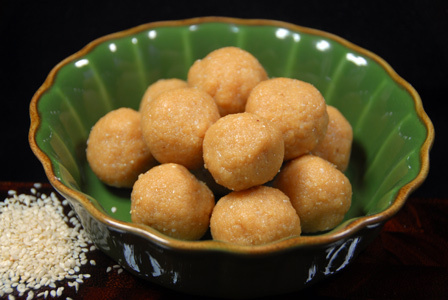 Makes: around 7 Sesame Cashew Laddu. Heat a heavy bottomed pan on low heat, add sesame seeds and fry till they turn light golden in color. Remove from heat and cool the sesame seeds to room temperature. Grind sesame seeds, cashews, grated jaggery into powder using a grinder. Remove the ground mixture onto a plate. Take lemon sized portion of ground sesame mixture and roll into tight laddu with help of hands. Store the formed sesame cashew laddu in a jar and they stay fresh for couple of weeks. 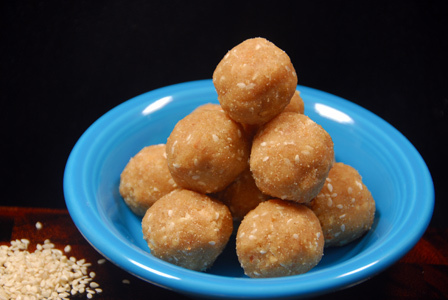 Serve sesame cashew laddu as necessary. Notes: Make sure not to over toast the sesame seeds. Suggestions: Adjust jaggery according to your preference. Choose somewhat soft jaggery if possible to ease the laddu making. If you have hard jaggery, you can melt with few tsps of water into syrup before adding the ground sesame cashew powder. Variations: You can also add a small pinch of cardamom powder or a tiny pinch of nutmeg powder while grinding. Other Names: Sesame Cashew Laddu, Nuvvulu Jeedi Pappu Laddulu. White sesame seeds are toasted on low flame till golden in color. They are then ground into fine powder along with coconut and jaggery. The mixture is rolled into small lemon sized balls and serve sesame coconut laddu as required. 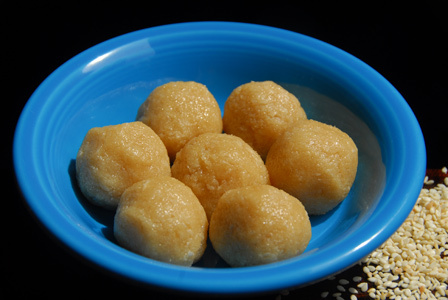 Makes: around 6 Sesame Coconut Laddu. Toast sesame seeds in heavy bottomed vessel on low flame. Once sesame seeds are light golden brown, remove from heat. Roughly mash the jaggery to make it easy for the grinder. Grind sesame seeds into fine powder using a grinder. Stir in grated coconut and jaggery and grind again into thick mixture. Grease hands with little ghee and roll a small handful of the sesame mixture into lemon sized laddu. Repeat the same with remaining sesame coconut mixture. Serve sesame coconut laddu as required. Notes: Make sure not to burn the sesame seeds. Suggestions: If the mixture is not suitable to rolling into laddu, leave for couple of hours so that the moisture comes down. Else, add more ground sesame seeds powder to the mixture and roll into laddu. Variations: Check other recipes with sesame seeds here. Other Names: Sesame Coconut Laddu, Nuvvulu Kobbari Laddu. A mixture is sesame seeds, roasted gram and cashews are ground into fine powder along with sugar. The mixture is then rolled into soft laddu with warm ghee. Serve mixed variety laddu when necessary. Makes: around 7 Pieces of Mixed Variety Laddu. Toast sesame seeds in a heavy bottomed pan until they turn golden brown in color. Remove from heat and cool them to room temperature. Grind sesame seeds, roasted gram / dalia / putnala pappu, raw cashews, sugar and cardamom powder into fine powder. Remove the ground powder onto a bowl, add ghee and mix thoroughly. Divide the mixture into 7 portions and roll each portion into a small ball with help of hands. Repeat the same with remaining portions and store the laddu in a tight jar and they stay fresh for months. Suggestions: Adjust the amount of ghee if you can form the mixture into a soft laddu. Variations: Use jaggery in place of sugar if desired. Other Names: Mixed Variety Laddu.